Wow, I did not expect her to actually do that. Since she’s in a contrite mood, this might be a heartfelt expression of thanks for stopping her from going on to commit more atrocities for so many relative years, and possibly an offer to help him escape back to SMT. Of course since it’s from Sera I, it might also be a little gloating that she escaped, and that in the end he delivered the tools needed to do so right into her hands. I imagine her mood is certainly full of sorrow. While they all carried the memories of what the first Sera did, the Ninth is the one that has to face Kindri! Well, let’s hear it. To be honest, I am not entirely sure what to expect. This seems at first to be a villain’s victory. The Siren, the Lady, was barely a person. She was an idea. But if the mask is off… perhaps whatever personhood remained within her has been allowed to escape that shell. Of course, what kind of person that may have been… I cannot even begin to speculate. We shall hear it Friday! Wait, you don’t have days there do you? She said she’d see the time traveling trio again, so it seems unlikely she’s setting up shop in Limbo again. Of course since it’s from Sera I, it might also be a little gloating that she escaped, and that in the end he delivered the tools needed to do so right into her hands. Where did you get this information? Which information? Sera VIII says the message is from Sera I (the first of us). My predictions as to the content are just guesses as to what might be funny. 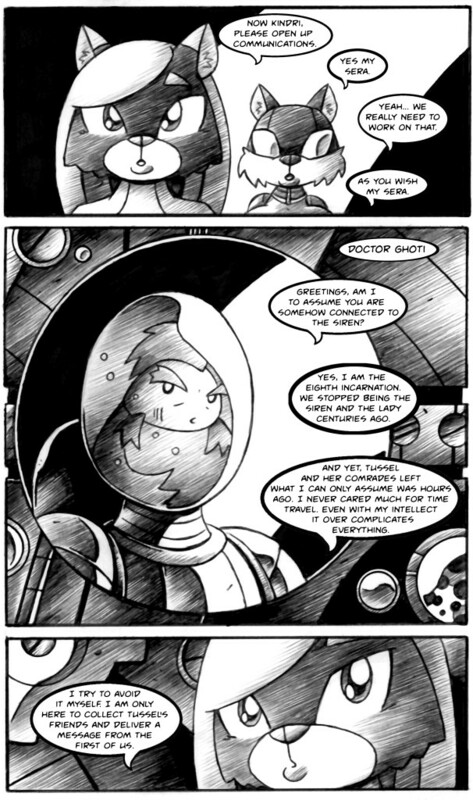 Dr. Ghoti did send Tussel and her friends, all full of paradox energy, straight into the Lady’s territory with no protection other than a malwared robot head. In a very real sense he ended their long feud by giving her what she needed to escape. Even if Tussel hadn’t cooperated, the Lady estimated she (Tussel) had enough paradox juice to allow the creation of a paradox energy production system.